Hope everyone had a nice long weekend! My friend Erick Itoman had a day off and hasn't had a chance to dive in a long time so we headed out to the blue once again in search of Wahoo. Saw some of the boys on the kayaks diving as well since it was a nice day. 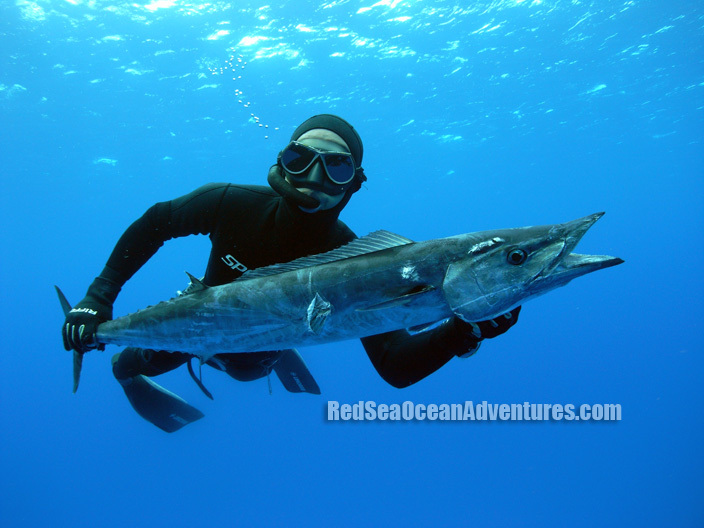 The current was mild so it seems the fish was not around but then two wahoo came by. Erick was down hunting as I watched him from above, then as he surfaced I saw them come in. They were not hungry so had to chase them down but luckily one turned and I got a shot off. Erick later gave it a back up shot so we at least got one for today. I wanted to test out a new underwater camera I got so grabbed a shot as well. Thanks Erick for a great dive! My new toy "5'-5" virus" has arrived thanks to Jason Kashiwai! It is super fast, easy to turn, and it's the perfect shortboard. You can ride it 3 fin or 4 fin and I'm ready to test it out with the new swell in town. I debated to let it cure but was too anxious to get it wet so I gave my nephews some posca pens and they went to town on the top deck. 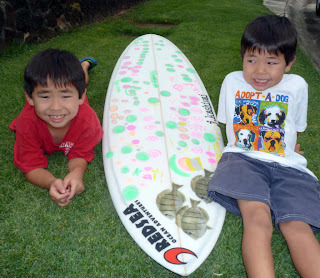 Kai (left) was super proud to color the board while Maika (right) focused on the details of each circle, spot, dot, etc..Guess which boy wants to test ride it first? MEEEE! See ya in the water! Last years Mexican shootout we got some nice fish come up and this year we are hoping for the same. On one of the warm up days I took a drop to find a school of Pargon (Dogtooth Snapper) on the bottom and lined up on one with my 120 cm pipe gun and luckily it stuck. There is a spot called "Pargon alley" which hold a bunch of these and they are fun to spear and also great eating. If you haven't speared a Pargon, Marlin, Wahoo, Mahi, or Roosterfish this is your best opportunity. We got some great sponsors again supporting the event and look forward to seeing you there on June 13-18, 2011! Email me if you want to join us! Yesterday was the day to dive! Forecast was for light and variable winds so headed to the supa-market again. I asked my family what they wanted to eat and they all said "Aku". Aku? No Kole? Ok den, Aku was are target and off we went...Captain James Oshiro behind the wheel and Kekoa Mau watching my back. James sent out the lines and kabam! screaming the lines as the aku was on! Kekoa and James took turns and we had one big hit on my Gaji lure that came off as the guys were playing tag team reel in. 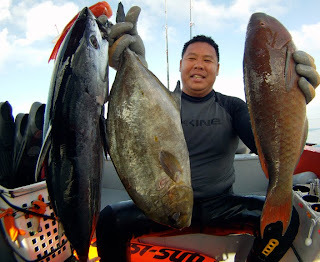 After boating enough we went dive on the reef for some variety. Kekoa got a nice catch and I also had a few pieces for the table. Got a bbq coming up so will be put to good use. Wednesday finally stopped raining and sun started shining so we decided to head out to the market. Most of the island was raining and created dirty water scenarios so we headed to the North shore which seemed the cleanest water. Kirby Fukunaga and James Oshiro joined me for a fun day of diving. On the way to our spot we were greeted by a pod of dolphins, about 100 dolphins just cruising and enjoying life. They followed us for a while then we departed to go dive. Tried for Ono's but instead came across Ukus. Had a few big ones in the 15 lb range come in but they were smart. You don't have much time to spear a hungry uku as they may come in for a few bites of chum then disappear. I had one come up and he got greedy so I let him have it. Kirby later got a good shot off on a Awa and Uhu which was perfect for an upcoming bbq. Thanks guys for another great day on the ocean! Windy weather for past week kept me indoors working like a slave. Editing shows, planning trips, researching the next destination. 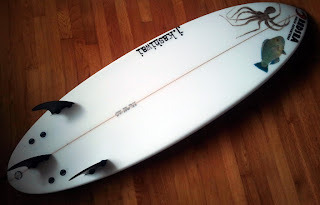 So I called my shaper, Jason Kashiwai and put in an order for the next board. Even though I getting older and arms don't paddle as fast the trend has been to go smaller so I'm getting a 5'-5". 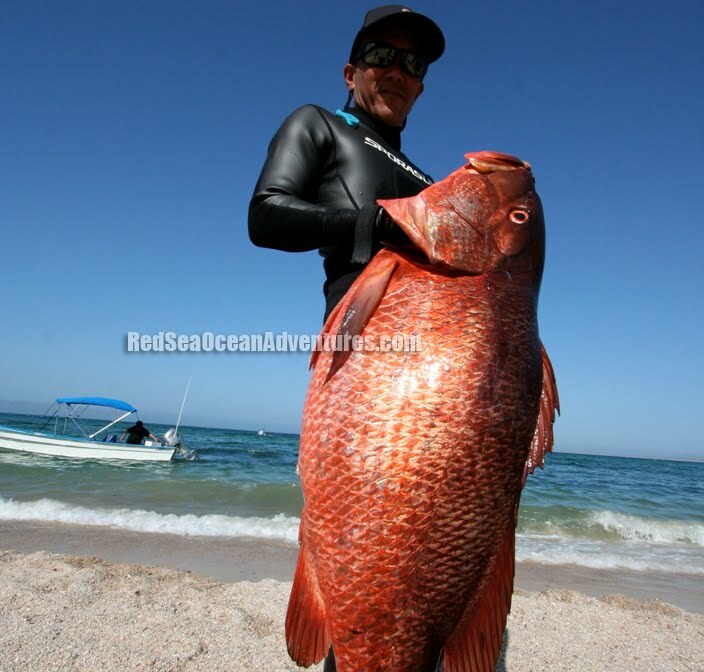 Jason has been working with me for a while and a huge supporter of Red Sea Ocean Adventures! Thanks Jason! He rips and here at Macaronies in Mentawais he was going off the hook, under the hook, and on top of the hook, throwing big sprays. If you haven't ordered his boards, just let me know and I'll connect you. We had a great time in Indo and can't wait to do it again. So ordered me my ticket and booked a group to the Mentawais next month for some more epic surf! I catch my best waves each year traveling and there is no comparison to the quality of these waves. You will never know unless you go! Happy May Day Everyone! Wow days are flying by so fast but at least sun is staying out longer! Freezer was empty so had to go to the market this weekend and stock up for dinner. First drop was to target Onos but it was a little slow coming so told my dive partner Keith Yamane to head up. He starts hooting through his snorkel Ono! I look and focus and see him dropping down and the fish came in. It swam in slow and noticed it was a great barracuda. Keith shoots and rolls it over, cold stoned! We try again but no Onos except a hungry shark so decide to check out another secret spot. The current is picking up and we start chuming, flashing, and next thing you know we see a couple mahis swimming. One of them curiously comes too close to my speargun and Pow! I leave it in the water as the other one comes in to bid his partner farewell but Keith is there and they both go to fish heaven. We end up with 3 mahi and another 4th is still swimming around but we had enough so headed in for some Kole action on the reef. After lunch we filled up our cooler and ready to head in as the thunderstorms were approaching in a distance. Mahalo to Capt. Cat for putting us on the spots and Keith for another great day on the ocean! Lucky we live Hawaii!